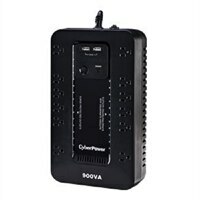 CyberPower Standby Series ST900U - UPS - AC 96-140 V - 500 Watt - 900 VA 7 Ah - USB - output connectors: 12 - BlackThe CyberPower ST900U uninterruptible power supply (UPS) system provides battery backup and surge protection for lightning-induced surges and other power events that can damage electronic equipment. This unit delivers enough battery backup to power connected electronics through utility power failure and enough runtime to perform a graceful shutdown to protect against the loss of data and damage to valuable electronics during longer outages. The ST900U has two USB charging ports with 2.1 amp shared total output which gives you a faster charging time. This unit is designed to minimize noise for a quieter work environment and to run efficiently to reduce power consumption. Including a sleek design, this UPS is perfect for all your home office and entertainment needs, including computers, gaming consoles, and broadband routers. The CyberPower ST900U uninterruptible power supply (UPS) system provides battery backup and surge protection for lightning-induced surges and other power events that can damage electronic equipment. This unit delivers enough battery backup to power connected electronics through utility power failure and enough runtime to perform a graceful shutdown to protect against the loss of data and damage to valuable electronics during longer outages. The ST900U has two USB charging ports with 2.1 amp shared total output which gives you a faster charging time. This unit is designed to minimize noise for a quieter work environment and to run efficiently to reduce power consumption. Including a sleek design, this UPS is perfect for all your home office and entertainment needs, including computers, gaming consoles, and broadband routers.